Les Trois Vallées claims to be the largest ski domain in the world (it includes Val Thorens, Courchevel, Méribel, etc). 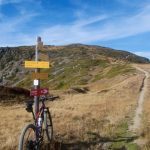 This fun mountain bike loop passes seven cols on a high ridge between Méribel and the lower part of the valley that includes Val Thorens. 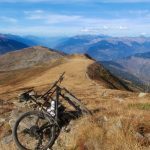 Admittedly, I would traverse to many of the cols but if you follow this blog you know how happy I am to visit 7 new cols! I started down low near Moûtiers immediately jumping on the quiet D96. These first few kilometres are paved but it’s a fun cliff/hairpin-filled road. 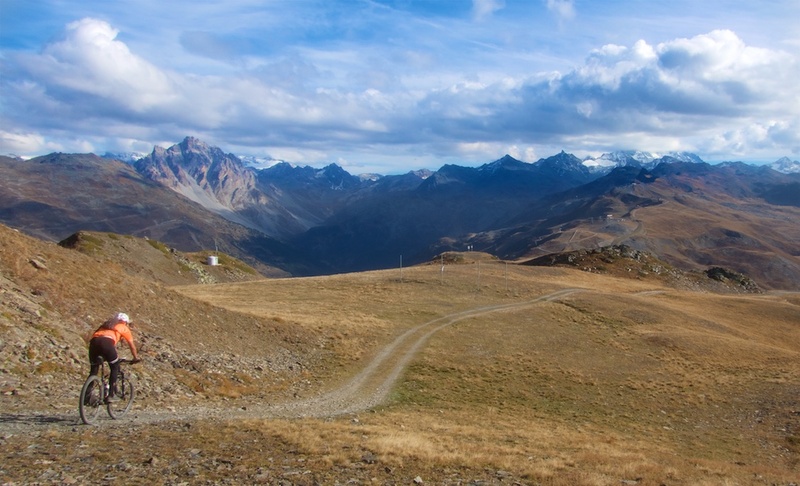 The 38 kilometre climb to Val Thorens is rumoured to be in the 2019 Tour de France. 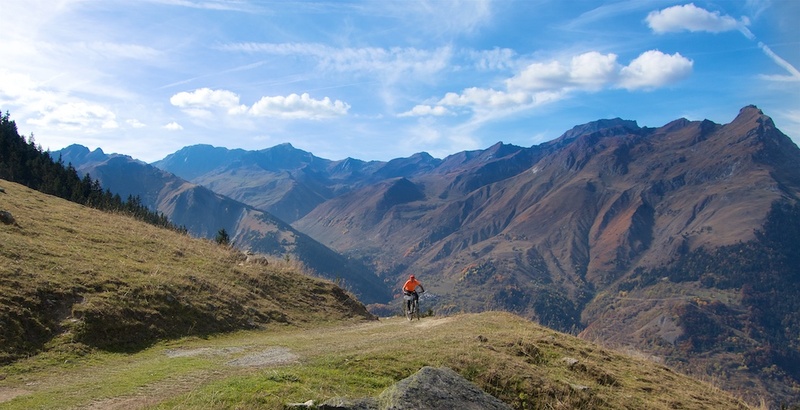 It also starts in Moûtiers. 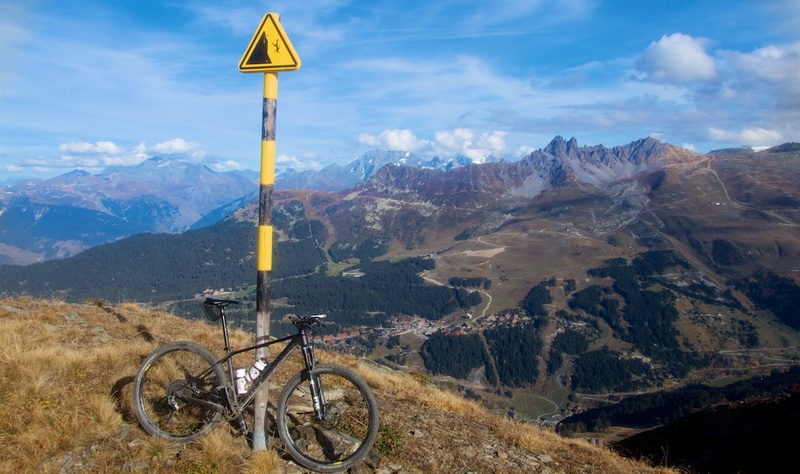 A good tip for road bikers: take the D96 that I started on during this ride as a far quieter option for the first half of the climb to Val Thorens than the main D117 road. 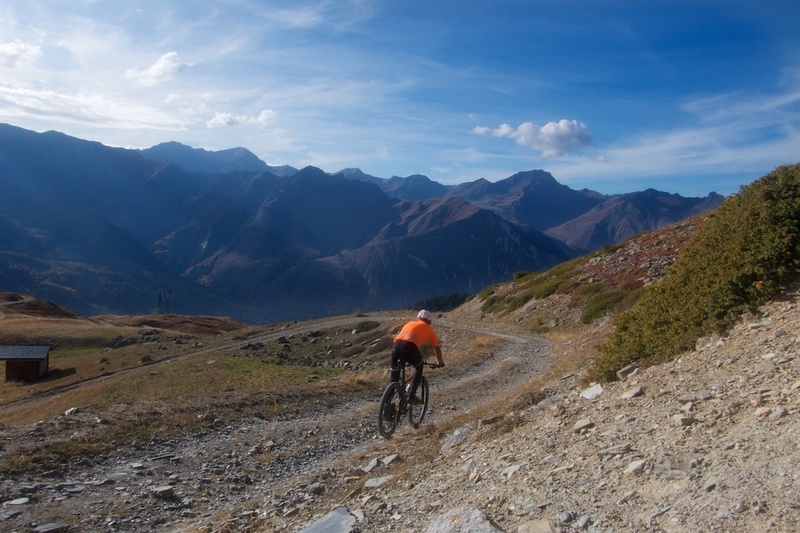 At roughly 1000 metres altitude I turned off the D96 onto a little road that soon becomes gravel. 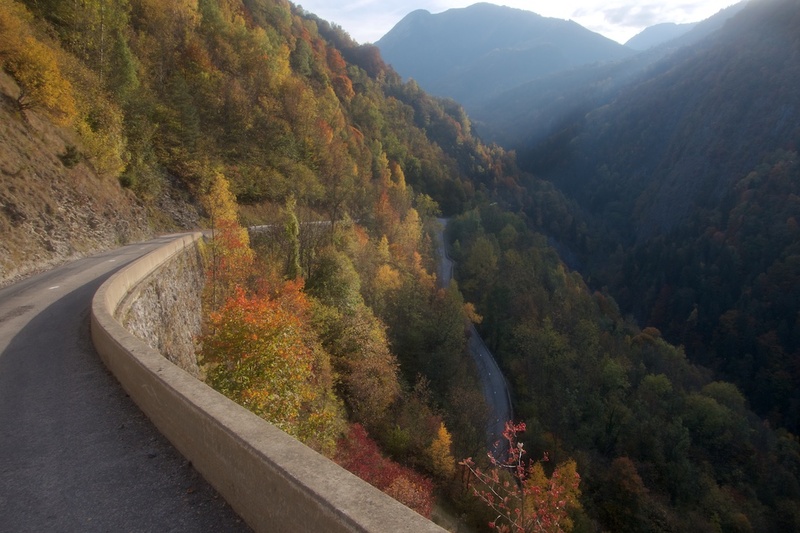 It’s a nicely engineered, often very steep road. Completely deserted, no people, no buildings, nothing. Excellent. 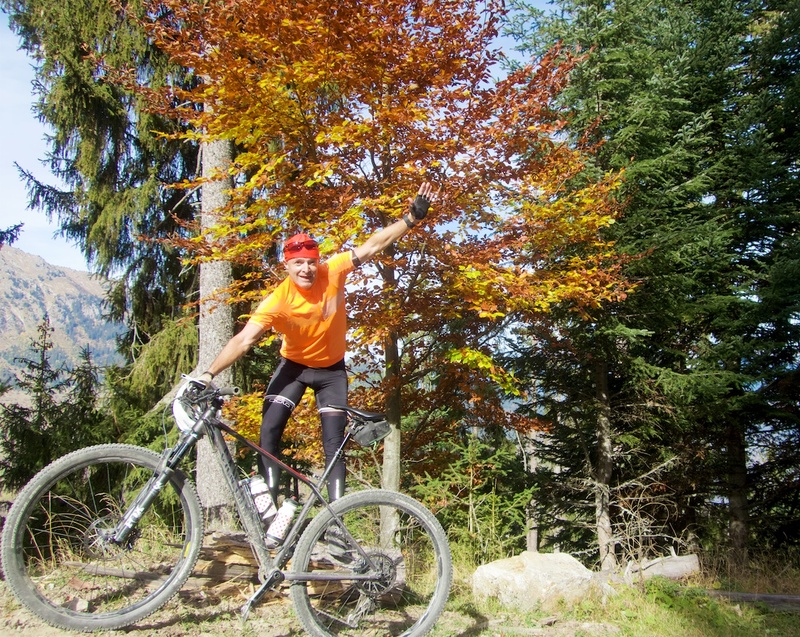 On a beautiful autumn day I had cleverly worn orange kit to match my surroundings. This is a difficult ride. The first 18 kilometres or so climb roughly 1600 metres (the map below highlights the steepness). 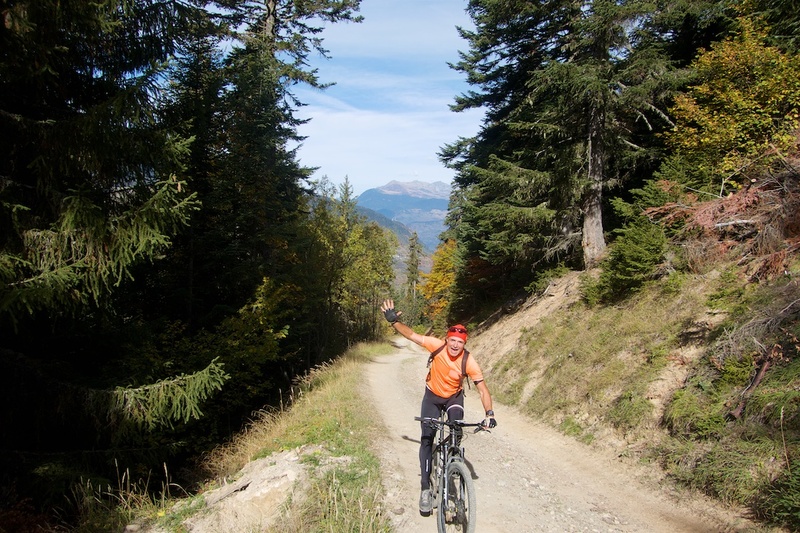 Just before the first col – Col de la Lune (Moon Pass! 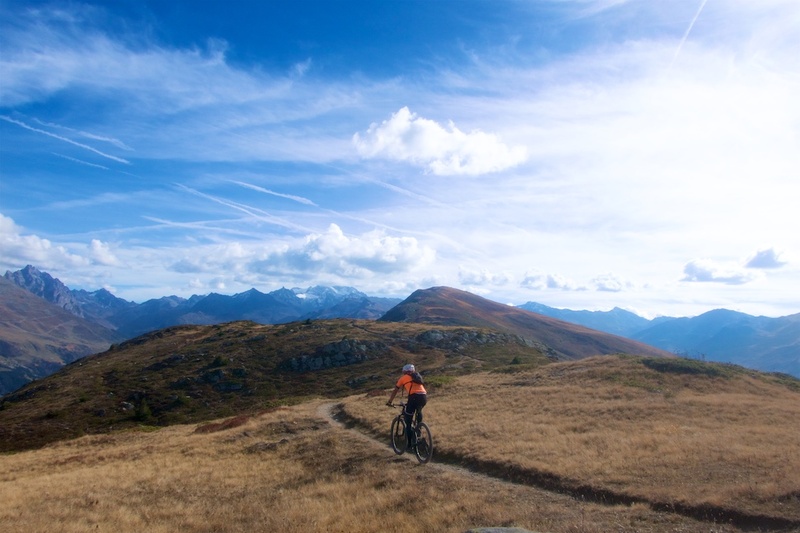 – 1785 metres) – I would get above the tree line and soon be riding along the top edge of a mountain ridge that I would follow 7 or eight superb kilometres. 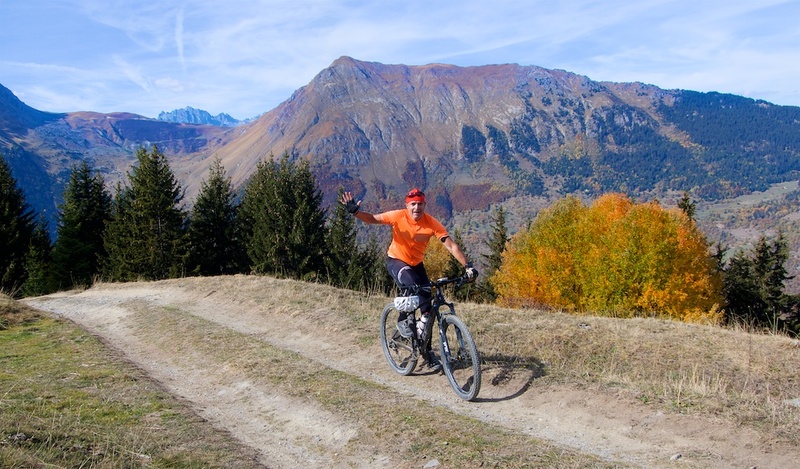 At Col de la Lune the road ends and this ridge stretch is on decent quality hiking trails. 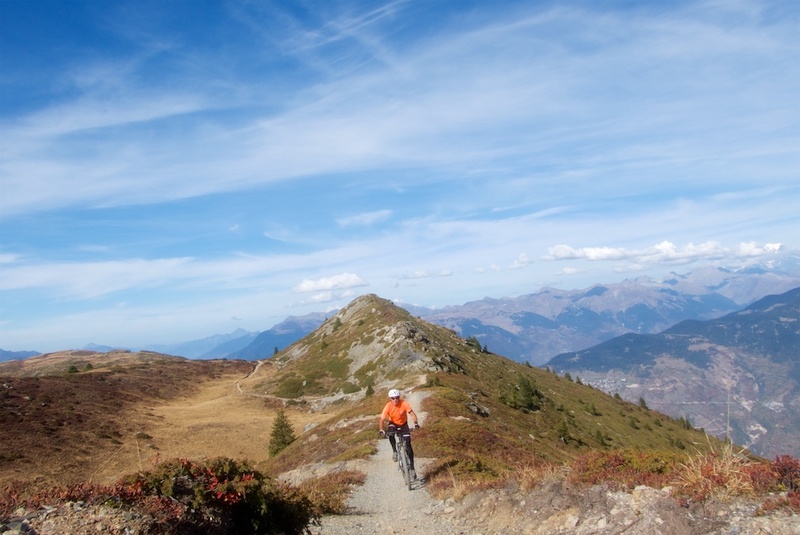 Probably the toughest part of the ride was the next stretch to Col de Leschaux (1990 metres). A touch of pushing. But from here the ride just gets better and better as I continued along the ridge, generally getting higher and higher. A bunch of photos along this ridge stretch. 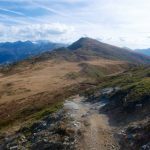 I could easily have continued along this ridge as I could see plenty of trails/roads continuing in the distance — basically there are ski lifts along the ridge all the way to Val Thorens. 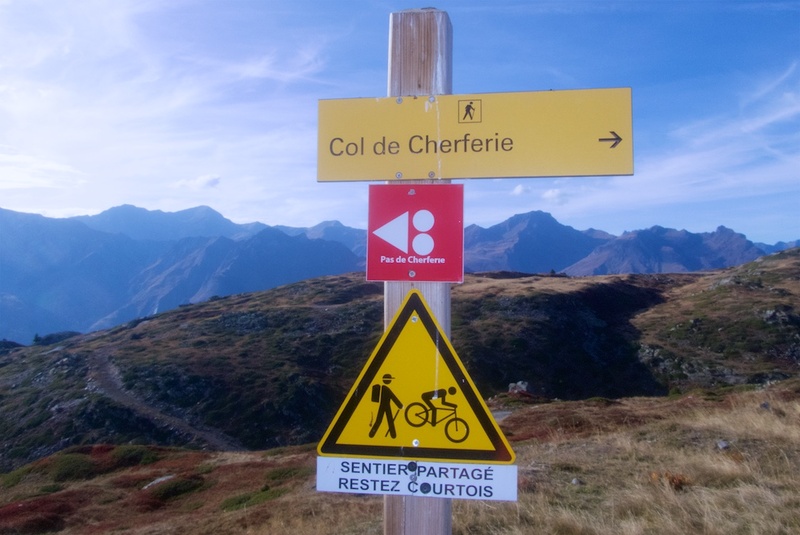 But at Pas de Cherferie I turned down, descending on a very rough ski-lift service road eventually rejoining the main paved road back to Moùtiers. I then jumped back onto the quiet D96 as soon as possible descending back to the start. This is a great loop. Always quiet, always scenic, often challenging. Looks like a lot of fun! Applause!